Investigation into Vietnamese tourist company exploiting endangered species reveals foreign tourists are a mainstay of the audience. In the Vietnamese tourism hotspot of Nha Trang, visitors from all over the world are a vital part of the economy. But likely unbeknownst to them, many foreign tourists are also a mainstay of cruel animal exploitation being perpetrated for entertainment. 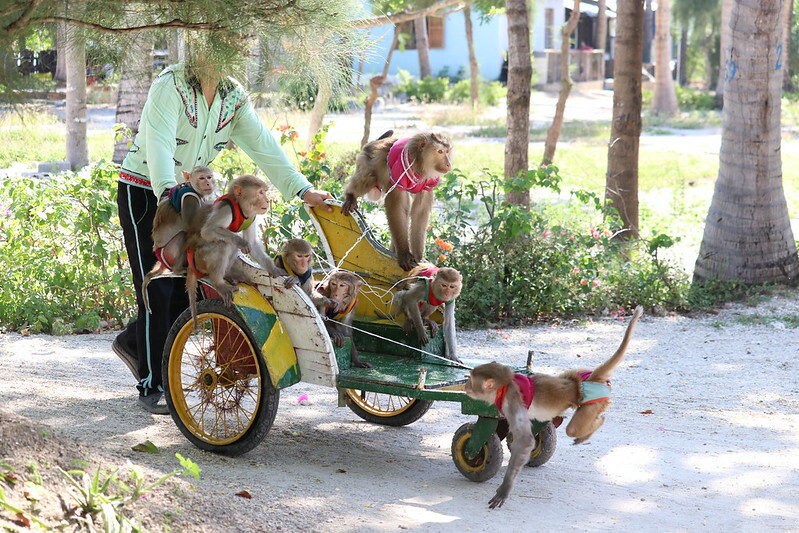 Animal circuses run by Long Phu company force juvenile moon bears to ride motorbikes and balance on cylinders, macaques to compete in swimming races, and ostriches and elephants to give rides. The audience at many of Long Phu’s facilities, such as Orchid Island and Monkey Island are diverse, with foreign tourists representing a sizable percentage. Footage taken at Orchid Island in May this year shows foreigners not only watching the shows, but actively participating. A young boy can be seen posing on stage with a juvenile moon bear – a protected species under Vietnamese law – while the animal wears a leather mask and gloves. In another clip, a teenage girl sits on a seesaw while the bear balances on the other end. At Long Phu’s Orchid Island, foreign tourists are enthusiastic participants in elephant rides, despite the animals having to be physically and mentally broken before they are willing to comply. Earlier this year, a report into alleged wildlife crime at Vietnam’s animal circuses sparked an investigation into the origin of the protected species on stage at the Dam Sen theme park. Moon bears – also known as Asiatic black bears – are a Group I protected species in Vietnam and are prohibited from commercial exploitation. Sadly, the authorities concluded no illegality had taken place despite never explaining how protected species such as moon bears are being obtained and exploited commercially. Vietnam’s bear bile farmers have tried for decades to breed the species but none have been able to do so successfully, fuelling speculation the young bears in circuses are being poached from the wild. Animals Asia’s 2016 wild bear survey, in partnership with Free The Bears, found an absence of any significant bear populations anywhere in Vietnam. Across all 22 protected areas surveyed, sustained declines were seen. Animals Asia’s 2017 report into animal performance in Vietnam found 19 species being forced to perform unnatural behaviours and held in poor living conditions at 16 facilities across Vietnam – some of which are funded by the government. Hundreds of individual animals are forced to perform under conditions of fear and violence including six protected species: moon bears, elephants, orangutans, macaques, pythons and crocodiles. The report found that 100% of the facilities failed to meet the minimum basic needs of the animals in their care.